LEXINGTON, Ky. (January 17, 2019) – The 48th Annual Eclipse Awards, presented by Daily Racing Form, Breeders’ Cup and The Stronach Group, will air live on TVG, the National Thoroughbred Racing Association (NTRA) announced today. Hosted by Jeannine Edwards and highlighted by the announcement of the 2018 Horse of the Year, the Eclipse Awards ceremony will be held on Thursday, January 24 at 8 p.m. ET in the Sport of Kings Theatre at Gulfstream Park Racing and Casino in Hallandale Beach, Fla.
TVG is in more than 45 million homes nationwide and also available via DirecTV Now, Apple TV, and Amazon Fire TV. The Racetrack Television Network (RTN) also will make the Eclipse Awards available across all of its platforms, including Roku. A livestream of the ceremony will be available online at Eclipse Awards partner websites NTRA.com, DRF.com, XBTV.com, and GulfstreamPark.com. In addition to Horse of the Year, the Eclipse Awards will bestow championship honors in 16 equine and human categories. The program also will include presentations of the Eclipse Award of Merit, for a lifetime of outstanding achievement in service to the Thoroughbred industry, to Joe Harper; the Horseplayer of the Year to Chris Littlemore; and the NTRA Moment of the Year, recognizing a singular significant occurrence as determined by fans. 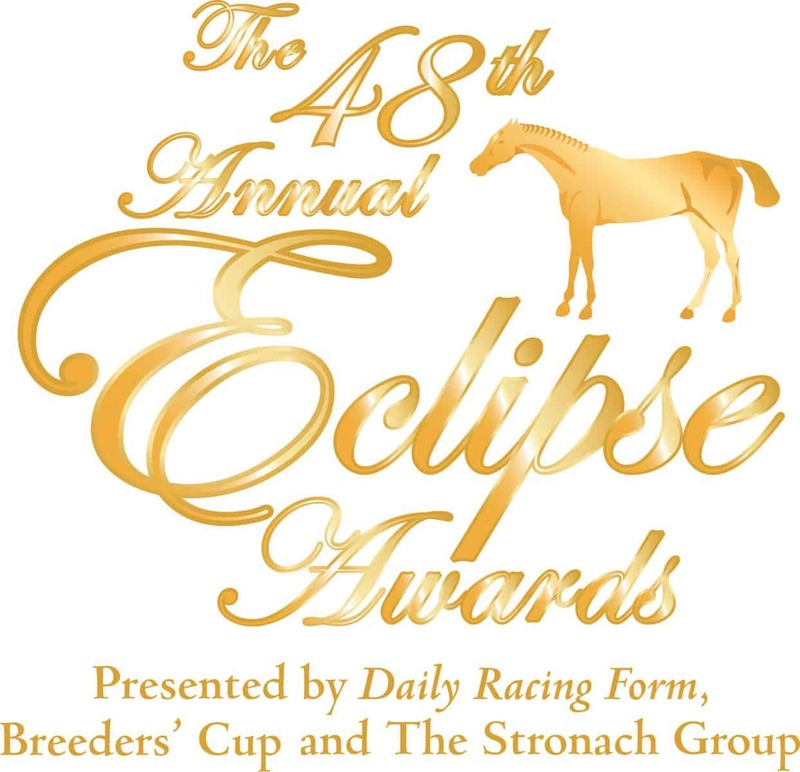 The Eclipse Awards are voted upon by Equibase field personnel callers and racing officials representing the NTRA; members of the National Turf Writers and Broadcasters; and staff from Daily Racing Form. Tickets to The Eclipse Awards ceremony are on sale for $425 each or $4,000 for a table of 10. For reservations, please contact Casey Hamilton of the NTRA at chamilton@ntra.com, or call (859) 422-2627. For more information on The Eclipse Awards, visit ntra.com/eclipse-awards. The Eclipse Awards are named after the great 18th-century racehorse and foundation sire Eclipse, who began racing at age five and was undefeated in 18 starts, including eight walkovers. Eclipse sired the winners of 344 races, including three Epsom Derbies. The Eclipse Awards are bestowed upon horses and individuals whose outstanding achievements in North America have earned them the title of Champion in their respective categories. Eclipse Awards also are given to recognize members of the media for outstanding coverage of Thoroughbred racing. Official Partners of the Eclipse Awards include The Stronach Group, Breeders’ Cup, Daily Racing Form, Keeneland, Florida HBPA, Kentucky Thoroughbred Association, Red Brand, Roberts Communications, The Jockey Club, Dean Dorton, WinStar Farm, EquiLottery Win Place Show, IOA Insurance, Florida Thoroughbred Breeders and Owners Association, Hagyard, Hallway Feeds, Thoroughbred Owners and Breeders Association, New York Racing Association, LUXAIR Jets, Jackson Family Wines, Tito’s Handmade Vodka, and Indiano Tequila. The official charity of the Eclipse Awards is the Thoroughbred Aftercare Alliance (TAA).